This uniquely shaped wallbowl features many shades of gold topaz and was made from hand pulled canes. Working with canes is a time consuming two-stage process, first Dirwood hand pulled the canes used to make this wallbowl, then he made this wallbowl using those canes. 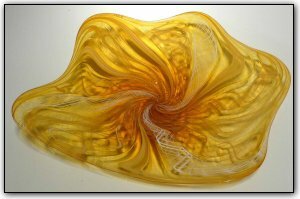 The end result is an absolutely stunningly complex pattern with intricate detail, creating a truly elegant piece of glass wall art.